Do you typically make your own salad? If so, add new flavors and texture to your salad by throwing in some delicious Kirkland Bacon Crumbles. There’s nothing complicated about this product. 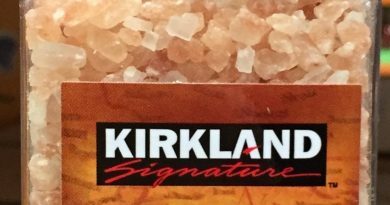 What you will get is delicious smoky bacon bits in a large bag that offers tremendous value and backed by the Kirkland Signature guarantee. These bacon bits aren’t crunchy but don’t worry, they are not overly soft either. Overall, these chopped bacon pieces offer great convenience for a busy cook or those looking to save time while preparing for the next meal. Great to mix in with salads or other dishes. Ingredients list: 100% bacon cured with Water, salt, sugar, sodium phosphate, sodium erythorbate, and sodium nitrate. 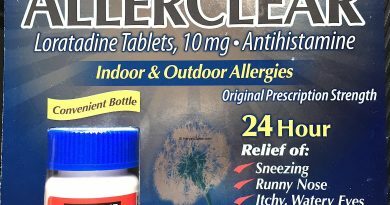 Product warning: The package contains a small oxidizer packet to maintain freshness. 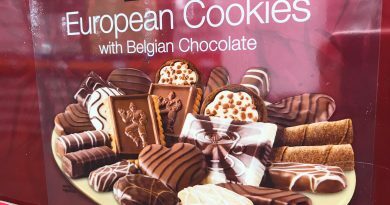 Do not eat! 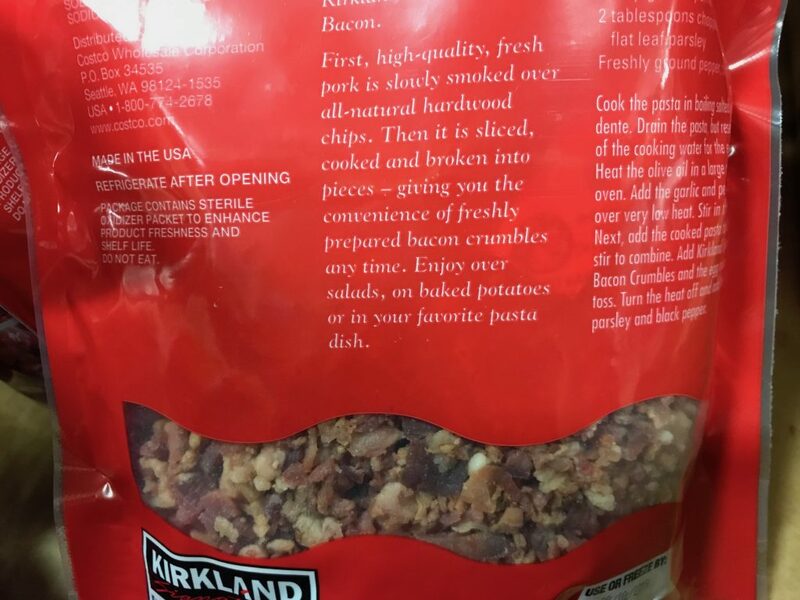 The Kirkland Bacon Crumbles serving size is one table spoon or about 7 grams. There are 81 servings per container bag. Each serving contains 30 calories, which includes 20 calories from fat. Each serving of bacon crumbles also offers 2 grams of protein but no significant vitamins. We all know by now that most Kirkland Signature products offer great value and good quality. 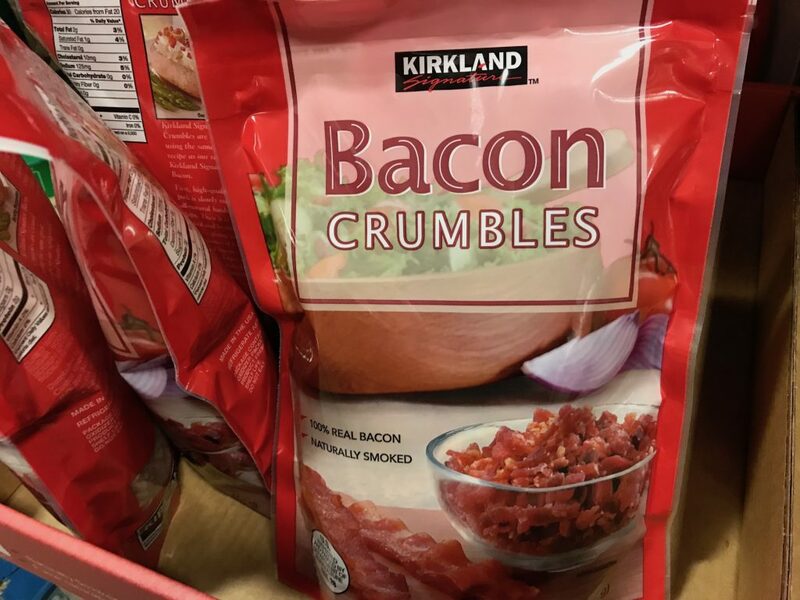 The bacon bits from Costco is no exception. It’s a big bag of bacon bits that are tasty but not too hard or crunchy. 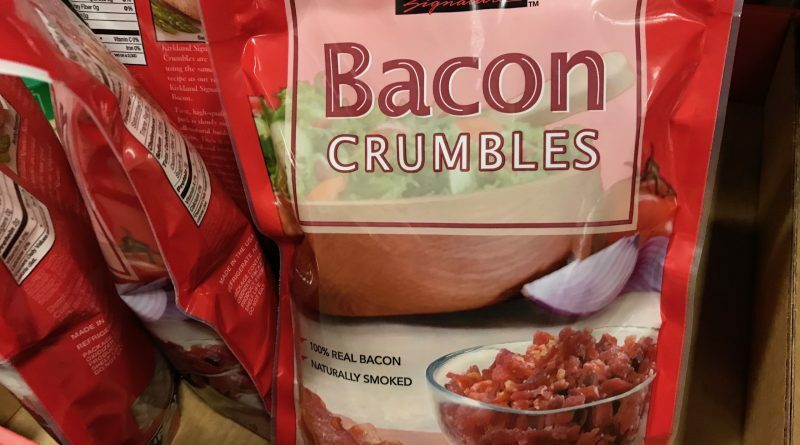 If you like to make your own salad for meals, it’s always nice to have some bacon bits ready to mix things up. As a source of protein, these bacon crumbles also add variety, texture, and a salty taste to what otherwise might be a bland salad. Sure, you can probably add some canned fish or mix it up with some exciting salad dressing such as a balsamic glaze. However, who doesn’t like the deletctable taste of bacon? For cooking, this is also an easy way to add salt or meat to a dish easily to enhance the flavors. Overall, I found this product to be very handy for a busy kitchen and definitely a staple for your pantry. 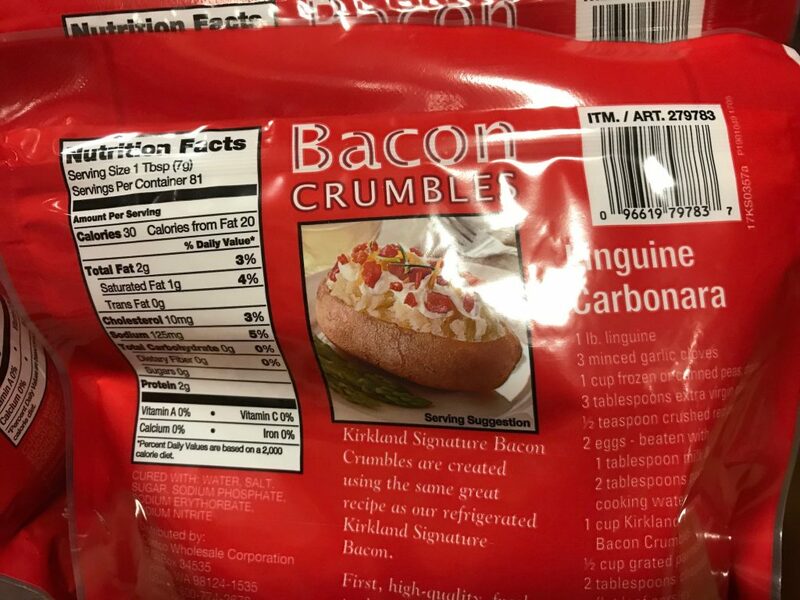 Looking to Purchase Kirkland Bacon Crumbles? Most Costco warehouses should have this product in stock as it is a core product. Based on my research, Amazon has this item in stock at the best price with shipping included.